Simply paste a URL of your choice in the destination box and the scanner will be redirected to that URL. Useful for advertising sites and products, this greatly enhances the accessibility of your mobile content. 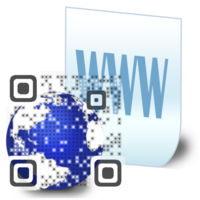 Use your Visual QR code to redirect the scanner to a specific YouTube video. This can be very convenient in how-to manuals and explanatory videos. You do not have to paste the entire URL of the YouTube video, its ID is sufficient for our generator to recognize the desired video. Who doesn't have a Facebook profile today? Redirect the scanner to any Facebook profile page and share your product or company with the masses in an instant. This works only in iOS devices. A real time-saver. Anyone who scans your QR Code will have a "compose email" box opened on their phone that’s addressed to the address that you have entered in the destination box. Use your Visual QR Code to create a contact in your scanner’s address book! Especially useful for business cards, this eliminates the awkward process of exchanging details and printing out endless cards. Visualead uses a special URL shortner technology that enables you to re-edit your content even after you printed your business card! Android scanners will immediately receive a vCard file (vcf), and iOS scanners will be redirected to a professional personal page where they can download the vcf from. Enter a phone number to send an SMS to.